Coming down by 224 points as of 11:38 p.m. ET, overnight Dow Jones industrial average futures. Signaling the October stock market drop that intensified on Wednesday could continue on Thursday. Futures implied the Dow will open Thursday down by 315.74 points. Overnight S&P 500 futures, for their part, were lower by 0.67 percent and continued to point to a decline at Thursday’s open. 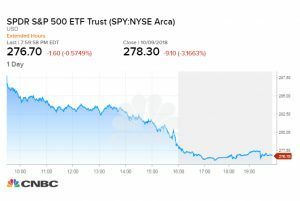 The SPDR S&P 500 ETF fell 0.57 percent in after-hours trading Wednesday, after falling 3.2 percent during a day which saw stocks sell off throughout the afternoon. The Dow Jones Industrial Average closed 831.83 points lower at 25,598.74 as Intel and Microsoft fell more than 3.5 percent each. The Nasdaq Composite plummeted 4 percent to 7,422.05 as Amazon and chip stocks declined. 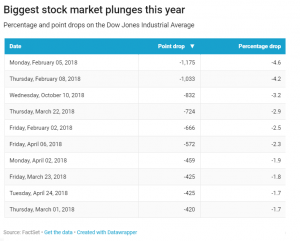 It was the worst for the Dow and S&P since February stock market values. At the same time, the most widely watched measure of investor fear spiked on Wednesday. The CBOE Volatility Index, popularly known as the VIX, leaped about 44 percent to 22.96 —its highest level since the beginning of April. The VIX measures implied volatility on S&P 500 index options. The Invesco QQQ Trust, which tracks the Nasdaq-100, fell 0.7 percent in after-hours trading Wednesday. Signaling tech stocks would be under pressure once again in Thursday’s session. This month in stock market the stocks have fallen sharply. For October, the S&P 500 and the Dow are down more than 4.4 percent and 3.3 percent, respectively. The Nasdaq, meanwhile, has lost more than 7.5 percent.